Samsung Electronics is working with local communities to make wishes come true this festive period. During this busy time, it’s sometimes easy to forget how difficult it can be for people to be separated from loved ones. With this in mind, Samsung are teaming up with local hospitals and charities across the Nation to create and donate unique experiences, powered by technology, to bring a little extra joy. The experiences could range from a Virtual Reality Experience, an Ultimate TV & Tablet Cinema Experience or a Gaming Experience. Samsung will work closely with each of the hospitals and charities to create a tailored package to suit their individual needs. However, this is no ordinary donation. Samsung is giving communities the opportunity to get behind their local hospitals and charities, and the people of Cardiff can help boost the donation of devices. The concept is simple. 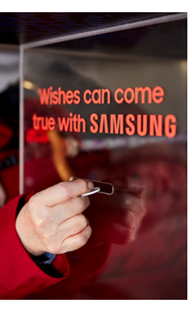 Each person who visits the Cardiff Samsung Experience Store during the festive period can make a wish for Cardiff & Vale Health Charity by dropping a token into the Wish Machine. The more tokens collected, the bigger the donation. If customers make a purchase, they can lift the magic even further with five tokens being automatically donated. What’s more, these gifts won’t stop giving as the technology donation will be installed as a permanent feature so that the experience can be enjoyed all year round. Until 22nd December, customers who come into store will also have a chance to win a wish. They simply need to share an in-store selfie of themselves and the Samsung device they wish for via Instagram, using #samsungwishescardiff and tagging @SamsungUK. Sam Grant, Chief Marketing Officer of Samsung Electronics UK, said: “We’re excited to see our tech bring joy to hospitals and charities across the country and it’s even better knowing that local communities can offer their support. A simple token donation will go a long way in making the wishes come true, and we look forward to seeing how the experiences are brought to life”. Head to the Cardiff Samsung Experience Store on Queen St today to help make Cardiff & Vale Health Charity’s wish come true.